It's Fred's fault... He recently mentioned building some foam-core models.. including a VooDoo.. I thought it would be cool to do my own 1/2A VooDoo from some little 18" span 5.25" constant chord foam cores that I've had for years. Since the tough part is coming along well.. I thought I'd post some photos. 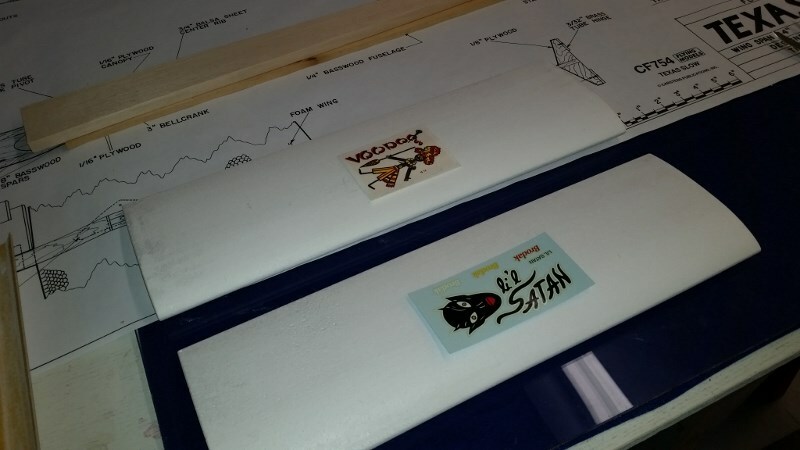 I attempted to eyeball scale the full-size VooDoo templates that Lieven sent me. I've still got some work to do, shaping the stab. and booms. I think I'll start with long booms.. and shorten them if needed. They probably should be glassed.. but I've never done that. The 18" core will be cut down to 16" and the tips will be installed to restore the span to 18.5" for a total of 97 squares. 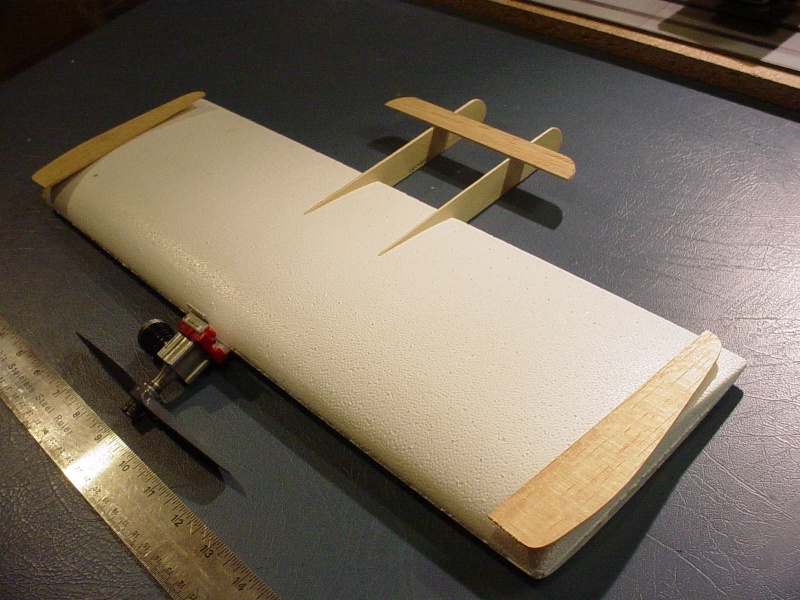 The 1/16" hard balsa stabilator spans 6" and has a 3.75 sq. in. area. This also seemed like a fun project for my postage-stamp mount. Maybe I'll try a bladder..
Late yesterday I hit work stop on the Texas Slow needing a new fuse (original is too warped) and some 3/4" Fat Balsa plank to cut out a new larger center rib. Ordered from Stuka Stunt the bass wood and some balsa planks are on the way. While fussing about what to construct waiting on the mail next week, I started to open the Brodak Jr Satan kit and had to move several boxes of Ace tapered and constant chord foam wing sets out of the way. Then an Idea struck me! Build a smallish VooDoo and Jr Satan using the wing cores. Hi Phred.. Since you're attempting to use the same "Ace" cores as I am.. I figured I'd mention a concern that I have. The airfoil of the cores is not 100% symmetrical. You could make tip templates and re-cut yours fully-symmetrical with your bow. I'm not sure how well they'll work otherwise. I'm sure they'll fly upright ok.. but inverted may be a different story. Can I counteract a lifting airfoil with a little down-thrust in the engine mounting? I'm planning on starting with very short throws on the stabilator.. so I want to be sure that I have enough "down" control. Are you saying they're intentionally asymmetrical or just not straight? RknRusty wrote: Are you saying they're intentionally asymmetrical or just not straight? Hi Ya' Rusty! Their spec'd as being 17% semi-symmetrical.. so I guess that means that there's 17% less a degree of camber on the bottom than on the top? I know that for c/l stunt.. they should be 100% symmetrical.. so I'm wondering if this is a recipe for disaster? This wing will want to lift while upright.. that's why I was wondering if down-thrust would work.. especially when inverted? I don't think a semi-symmetrical airfoil is necessarily a recipe for disaster. 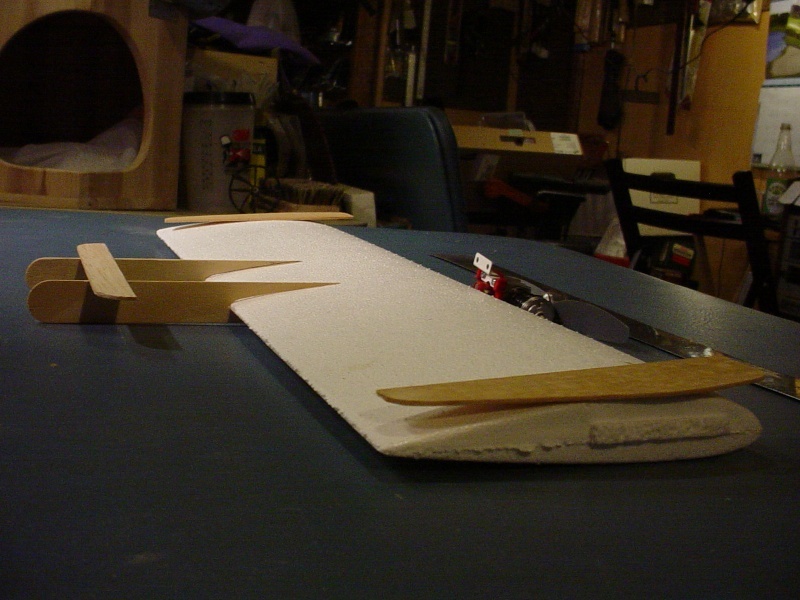 Some CL planes into the 1960's used modified Clark-Y (flat bottom) airfoils. Many of the pre-1950 CL aircraft used Clark-Y. It should do inside loops more tightly than outside loops. I dunno. Give it a shot and see. Not certain disaster at all. I don't think it's worth worrying about. Just fly it. If it flies differently inverted, just compensate with your control inputs. 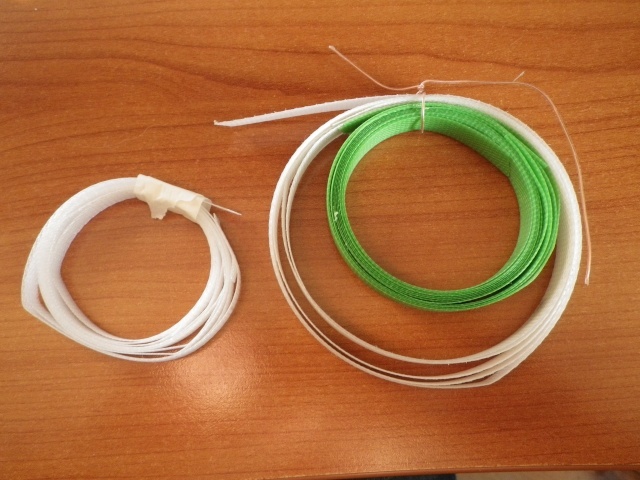 The outside loops and inside loops will be different sizes so do them high till you get the feel of it. That's the nice thing about Not being concerned with precision. You can just fly it and everybody thinks you're an expert. George beat me to it. Thanks guys.. I'm kind of committed at this point. I took a razor saw to the tips and clipped an inch off each. 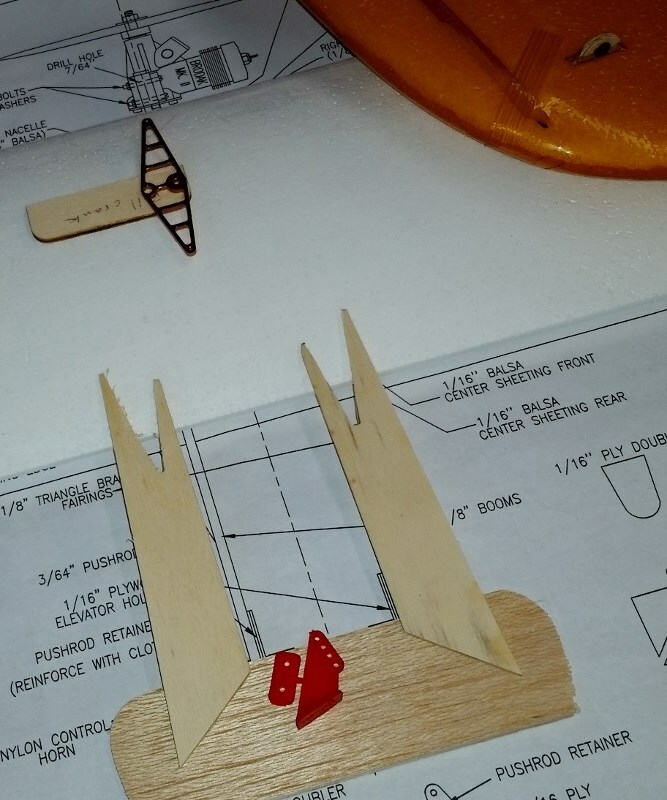 I made 1/16" sheet balsa tips to restore the span to 18.5".. and have made "some" tip-braces. I need some advice on the bellcrank/lead-out arrangement. In any case; I plan to recess guide-tubes down 1/2 way into the tip. Should I hog-down to form a bellcrank bay.. and slot the inboard wing for the lead-outs? If I don't.. and just mount a bellcrank on the bottom or top surface; I will either have a tip-high or tip-low condition; respectively.. as opposed to level. I'll be using "solids".. so they wont saw-away at the foam like a braid might. 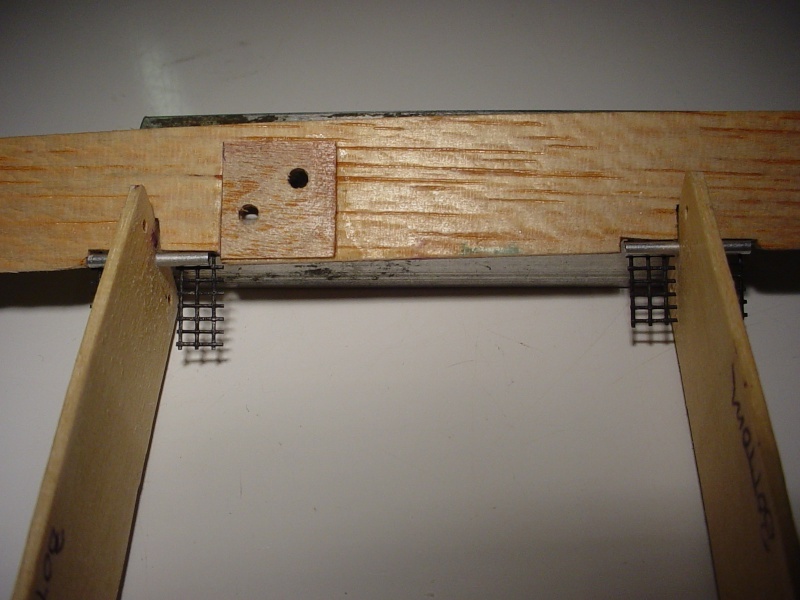 Econokote would seal and bridge the slots cut for the lead-outs and pushrod. If I use one of my small custom 1.5" bellcranks.. I could hole-saw cut through the entire panel with a 1.5" tool.. and hog-down a channel for a 1/16" plywood mount, that would be epoxied in place. 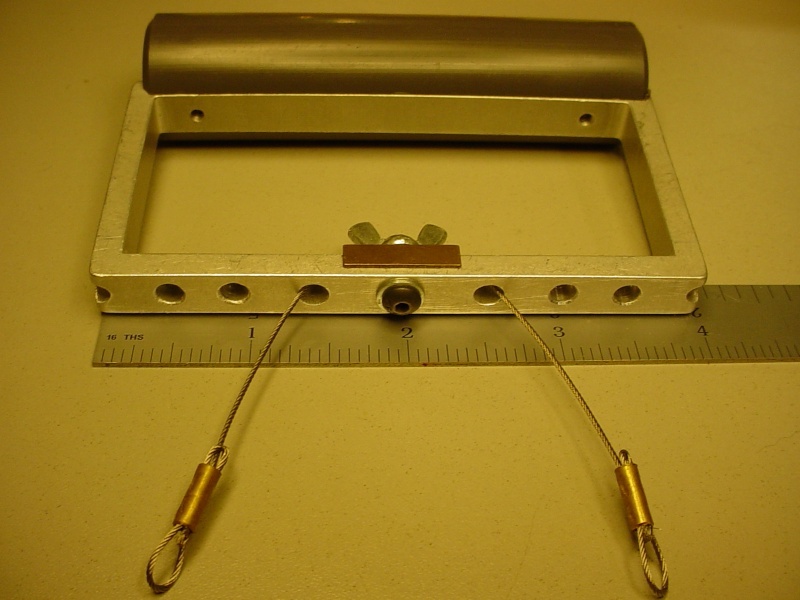 This would provide access for installing the bellcrank with machine-screw, washers and locknut. 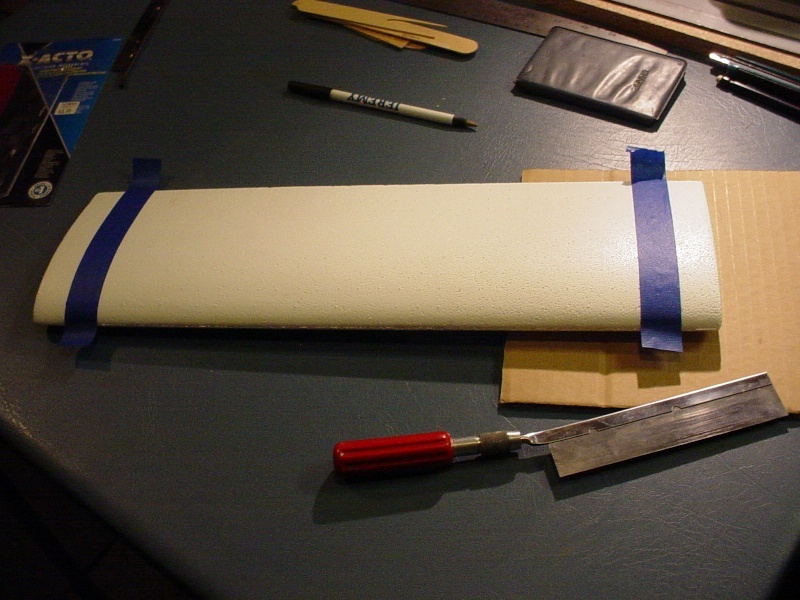 I can make a gage-block for sanding the lead-out slots 1/2 way down into the foam. Cool idea! One set of constant chord wings will make one set of combat planes! I wouldn't worry at all about them being semi-symmetrical. If I had a spare set sitting around, I'd give this a try. As for the bellcrank, I'd just do a surface mount, centerline behind the engine mount. I've used these wings in the past, and I know I'd prefer not to weaken them by cutting troughs for the leadouts and a well in the center for the bellcrank. I think this would greatly increase the likelihood of a wing failure in the cores. Epoxy a small square or round of 1/16 ply top and bottom, and then put a tube going top to bottom for the screw to go through so the foam doesn't get crushed as you tighten the bellcrank screw down. Since your elevator is high on the tail, a top mounted bellcrank keeps a straight pushrod. If you had the leadout eyelets on the top of the wing/wingtip, I doubt you'd really see any appreciable difference than if it were wing centered. you're not building a super-duper contest plane, so the trim isn't going to be that critical. Just ensure the engine thrust line is in line with the wing chord. The full flying stabilator will take care of the rest. Roddie, when they say it's a 17% semi-symmetrical, they mean that the total thickness at the thickest part of the wing is 17% of the chord length. So, for an R/C wing, the chord is kinda fat. For a C/L stunt/combat plane, it's not that fat at all. With the way this thing should flip about if built as a L'il Satan, the fact it's semi-symmetrical is negligible. batjac wrote: Cool idea! One set of constant chord wings will make one set of combat planes! I wouldn't worry at all about them being semi-symmetrical. If I had a spare set sitting around, I'd give this a try. Hi Mark, you've swayed me the other way now.. and it's a good thing.. My hole-saw is loaded and I had plans. One point.. my tail-feathers aren't done yet.. The stabilator will be lower.. centered on the booms actually. I want to mount it's horn near the hinge-point just inside the boom. Boom spacing is 4".. so that would place a straight pushrod shot about 1-7/8" inboard from the centerline. I'm still wanting to bury the bellcrank in the wing though. It will look a lot nicer and be more streamlined. Roddie you might want to reconsider that mini bellcrank. This plane is going to be twitchy enough without making it too much of a handful for you to handle. That is if you're really going to fly it. What Rusty said about the very small bell crank... this plane built either way is a very fast twitchy bugger that you want very slow controls on until you get froggy. I plan on one of these 2.25" aluminum BCs and a fairly tall plastic horn with rod in top hole...Later I can put rod in a lower hole to speed up/ and increase the elevator throw. I plan on using soldering iron to recess the bell crank ply flush to the surface, a plastic through tube to the piviot bolt and a small ply bottom piece to prevent crushing the wing. In the extreme upper right of the photo is one of my smaller combat wings lead out guide suggestion. 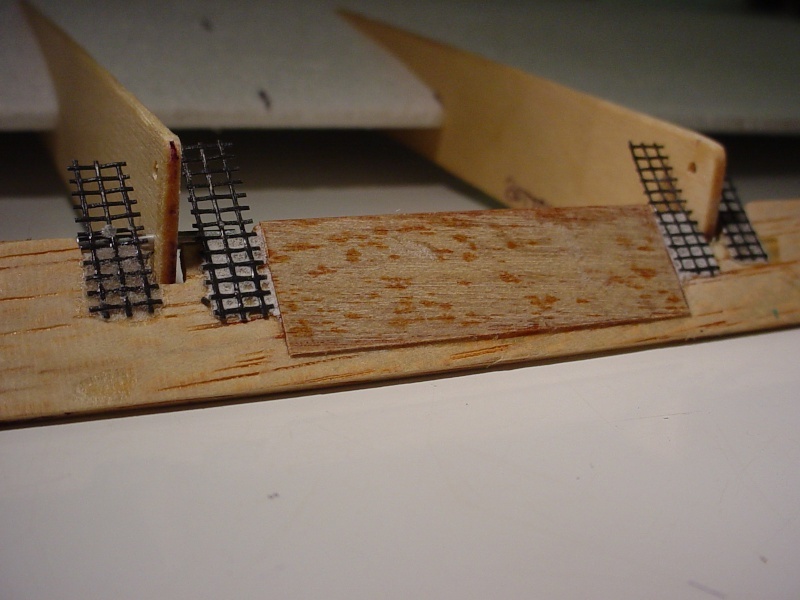 Simply a small piece of ply buried and epoxied slightly aft of the CG. Both lead-outs pass in the same hole and this has proved very efficient method. That's neat, I didn't realize there were high tech bellcranks available. I agree that the little cores should be tough at 16" span (18.5" w/the tips). The 1.5" bellcranks I made; are not pre-drilled for the pushrod or lead-outs.. only "witness-marks" a few thousandths deep to mark the centerlines in relation to the pivot. I could choose to drill a pushrod hole very close to the pivot.. for minimum linear travel.. and use a long horn on the stab, starting with the outermost hole. That's really what would dictate the sensitivity.. right? I'm going to try to incorporate an adjustable front lead-out into the tip and cut the front lead-out slot with a slightly increasing outward taper toward the tip and closer to the rear lead-out slot.. to prevent binding. (sort of like lengthening rib holes an a built-up wing) I'll likely be using .025" dia. m/w solids.. for the lead-outs. Although far from completion.. the weight is at 2.95oz. The problem with push rod hole too close to the pivot is total travel. And a narrow spacing BC then demands an equally very narrow handle line spacing to retain a 1:1 ratio of up and down elevator throw. Your's will work but be extremely sensitive. fredvon4 wrote: The problem with push rod hole too close to the pivot is total travel. And a narrow spacing BC then demands an equally very narrow handle line spacing to retain a 1:1 ratio of up and down elevator throw. Your's will work but be extremely sensitive. Hi Phred, cool link! Fora's... I've heard about them.. screamers.. I set-up a 1.5" handle spacing for the same bellcrank I put in my Rare Bear speed model. Although as yet "untested".. it will have a 1:1 ratio. I'm hung-up on a nacelle design. My gut is telling me to go with a plywood box.. faired into the leading-edge.. as the tailbooms are to the trailing edge. A balsa filler-block on the inside. A postage-stamp backplated Bee won't weigh much.. and my custom mounts are short. Crankcase to firewall distance is .531" Question is; should I build the radial mount's firewall close to the wing's leading edge.. or should I design the engine mounting to be adjustable.. by using firewall shims of 1/32" plywood? 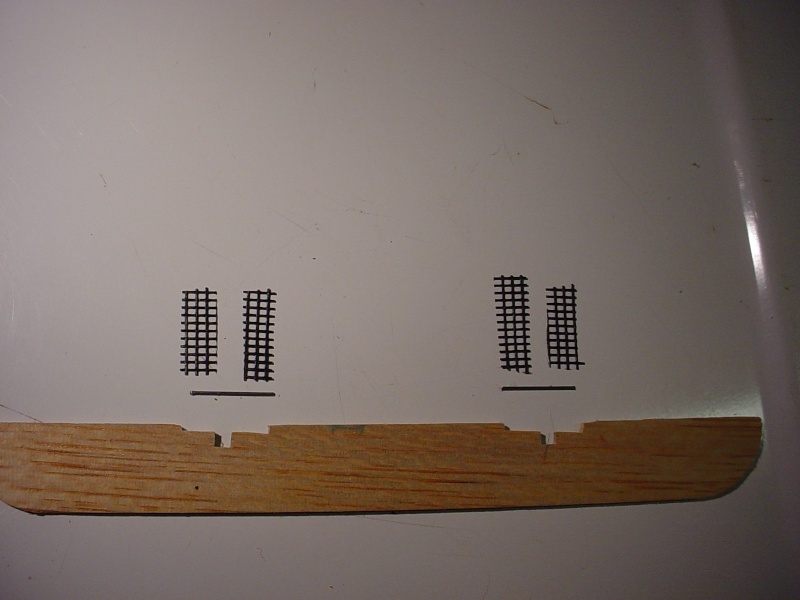 Four shims would provide for 1/8" of CG trimming. That would be very useful I think. 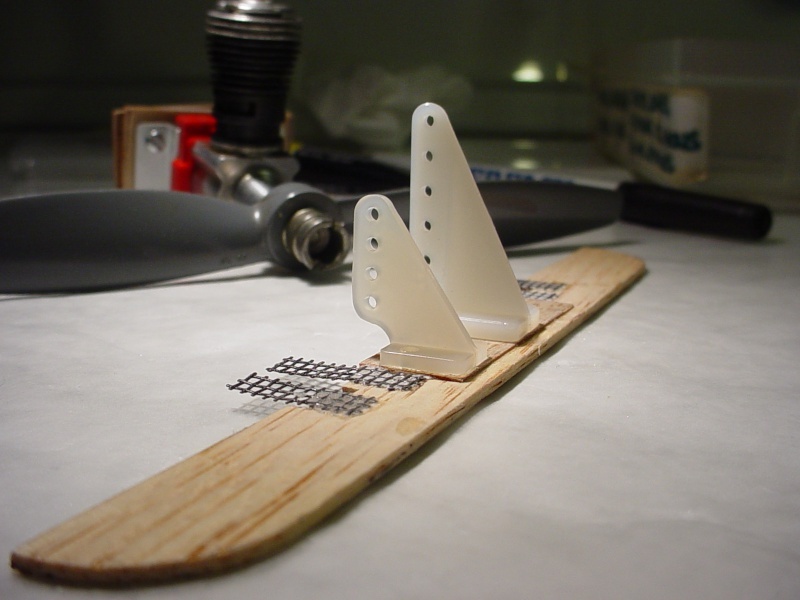 The firewall "backplate" which will be on the wing's leading-edge, will have 2-56 threaded T-nuts glued-in.. so that varied length machine-screws can be used to suit the amount of firewall shims used. This is what I enjoy... (while most of you are thinking.. "just build it") I really enjoy thinking about design. Laying out my wing-core tonight (just came back from a R & R on Cape Cod) The original Riley Whooten Voo Doo wingspan is 36"... I'm building a 18" .049 Cox reed-valve powered version.. just to re-cap. Boom-spacing on the original is 4.75"... 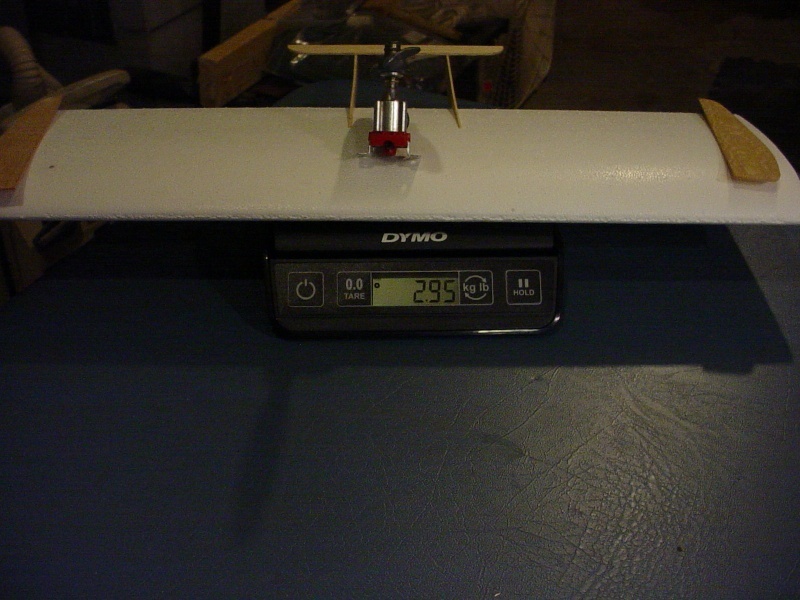 This scales to 2.187" for a 50% scale version. I will mark my wing's T/E and stabilator for the boom's location. Hinge-detail is something that I've been thinking about. I'm thinking a pair of .025" dia. music-wire pins.. about 1/2" long... would be strong and lightweight. 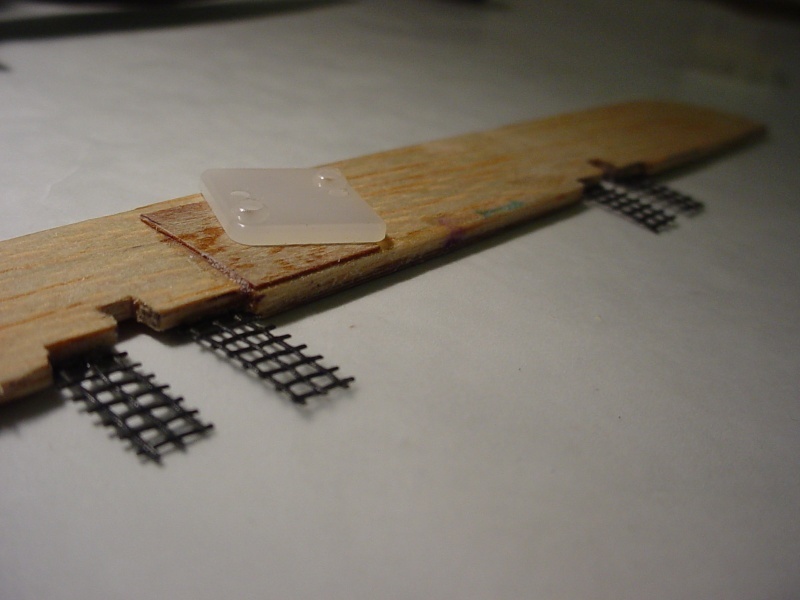 Loops of fiberglass screening to provide the hinge at the stab's L/E. 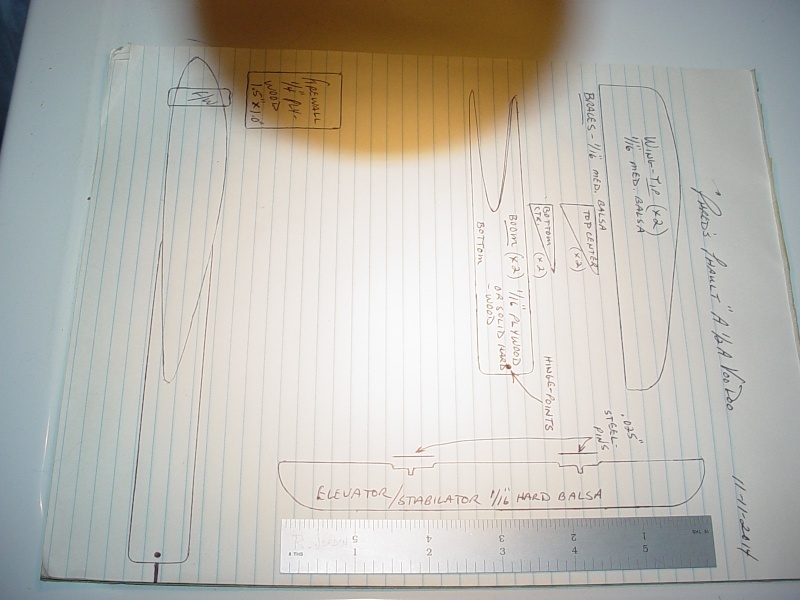 I'll drill the booms, and make the set-up..
and probably seal all the wood, after gluing-in the screen hinges (BTW.. they hold with CA for tacking..) Maybe I could forego the epoxy reinforcement.. and try balsa filler to fill the screen.. and feather-sand to the stab?" That would be a lot lighter. I'm hoping to deal with CG issues up front... mainly with the engine. A planned balloon-tank will straddle the CG. if it is about 1.5 inches back from LE +/- 1/4" you are done. I'm not completing anything yet.. but bouncing between different areas of construction. I also decided to start tracing the parts.. and making notes on mat'l. specs. Looking at the profile at the left of my drawing.. you can see where I'm insetting a 1.5" x 1.0" x 1/4" plywood block into the center of the leading edge about 3/4" to 1" deep. This forms a mount that has a lot of area for a glue-bond. Extending the engine forward is a simple matter of using shims/longer screws.. but gives a strong initial base that's less likely to break-off when "you know what" happens.. I'm going to box-in the sides with 1/64" ply to further add strength.. and protect the foam from dings. The "290" retro-engine will be mounted "cyl. 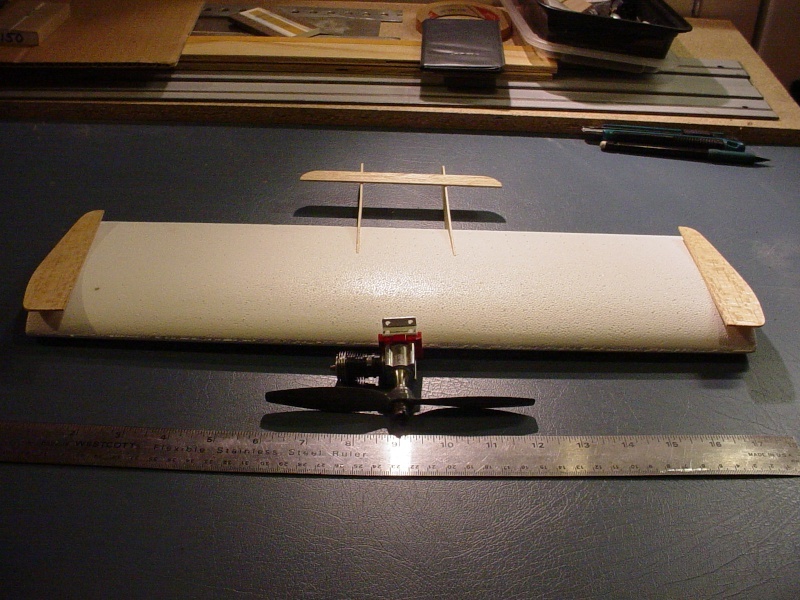 up"/"needle-up" with my custom mounts running horizontally, for a more streamlined airframe. I shortened the booms last night.. which makes the tail-moment scale to the full-size model. This tall horn is screaming "over-kill" to me.. 1/64" ply spreader-plate on the top, spans between the booms.. and a 1/2" square plate on the bottom for the mounting-plate. 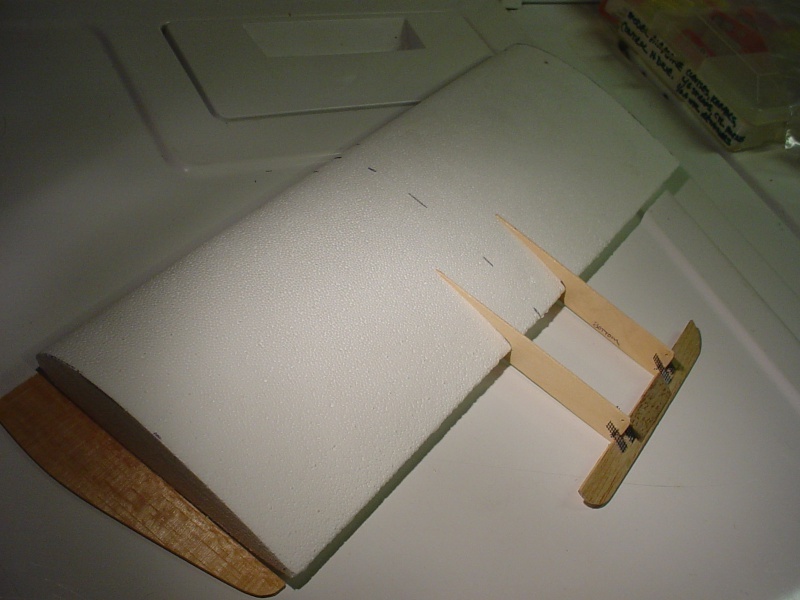 I spent some time on the tail this afternoon.. and made a design change in the hinge-pins. They are .062" OD x 1/2" long pieces of alum. tubing. These fair into the 1/16" sheet stab beautifully.. are light.. and will be less wearing in the boom holes, than the smaller steel pins would be. I hope this tail isn't too fragile.. It's super light. I may go with a carbon-fiber pushrod.. just for less of a torsional load. Hey Eric.. not sure if your seeing this correctly. 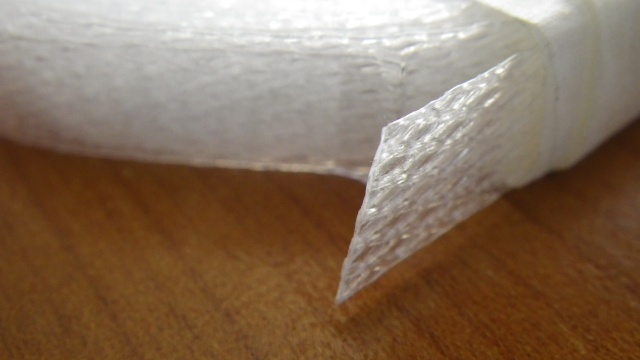 The screen will be looped around the pin and glued to the other side of the stab. The pins ride in holes drilled in the center of the booms. Here's a shot of the underside.. I ended up choosing the shorter horn's mount-spacing.. and drilled .089" clearance holes for it's 2-56 x 1/4" long screws. My planned "belly-tank housing".. will be slightly set (1/4") into the bottom of the wing.. and will house a balloon tank of 7-8cc's.. I'm not sure how to hold it in place yet.. but I want fore/aft adjustment. Coarse sandpaper attached to both the tube and it's "saddle" will provide a friction hold.. and a rubber-band strap to hold tight. My fuel line will have a straight-shot between the tank and backplate.. and should be shorter than 1 inch.. with the firewall set back in the wing. I was brave with the razor saw.. when I "lobbed-off" the tips; an inch each.. but now it's time to do some serious cutting "into" the foam.. at certain depths-widths.. and squarely. I wish I had hot-wire equipment. That's ok.. I have knives and sandpaper. This is a bittersweet build.. because when I built the Rare Bear for the 1st CEF Speed Contest.. I had been unemployed during that time. I just received notice this week.. so I find myself back there again.